Second Sight: A Paranormal View: Haunted Holy Land: Waterbury Connecticut that is…. 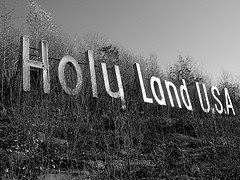 Holy Land USA was created by a grateful Yale Graduate, John Baptist Greco as a type of theme park for believers. It was meant to teach bible stories and give visitors a sense of what the "old world" would have been like. Fallen into disarray during the 1980's, this theme park became a favorite spot for local teens to vandalize and spray paint. Although the statues and monuments were meant to be simple reproductions, the vandalism and decay of the theme park has left the place with a real sense of tragedy. The first story of its haunting was reported in 1984. Passerby's claim to have seen a woman near the gate of the Holy Land who disappears in a phantom car when the gate is approached. There has only been this one reported sighting on this location. Now owned by the Sisters of the Fillipini, the land is private property so ghost hunters will have to get permission to enter and investigate. Those who have share these stories. One ghost hunting team reported feeling peaceful when entering the overgrown Holy Land and experienced an unexplainable battery drain on his camera. Some ghost hunters believe that batteries drain on equipment when in the presence of ghosts because they need the energy to manifest. Some websites claim to feel murderous intention at this place, but records show that no murders or misdeeds, other than the vandalism, ever took place here. The creator of Holy Land USA died at age 90. Hopefully his good hearted intentions and spirit will live on. I guess afterall, the only ghost here is the Holy Ghost. Good.....i have been here and there is NO ghost or evadence that there ever was.....i have been doing this for 35 years and i have helped solve a number of unsolved deaths....paranormal and not. Iam replying to your e mail which is 5 years old. You are a moron. Go preach atheism in Syria or Saudi Arabia. They will set you on fire or behead you. First of all, this is a blog, not an email, I am not a moron, nor an atheist. And luckily, in America, we have freedom of speech and religion. Thanks for your comment. It's a shame that this theme park closed down. This could have been some revolutionary since a lot of people have been losing faith. What is ironic is, its still attracts people but for all the wrong reason. Now they consider is as a horror park rather than a religious one.